You know the old saying, “What doesn’t kill you makes you stronger” or “no pain, no gain.” I definitely find some merit in those statements and I have found them to really be true in my life in many areas. But when the tables are turned and it is your son having to experience the pain in hopes of some gain, everything changes. I took Cole to his physical therapy appointment last week (and we are very grateful to the team at TOC for their awesome care). I knew going in that it was scheduled for the therapy room and not the pool… which that was hard news to break to Cole as he loves the pool part of rehab. Going to the therapy room involves some fun, but also involves some pain. 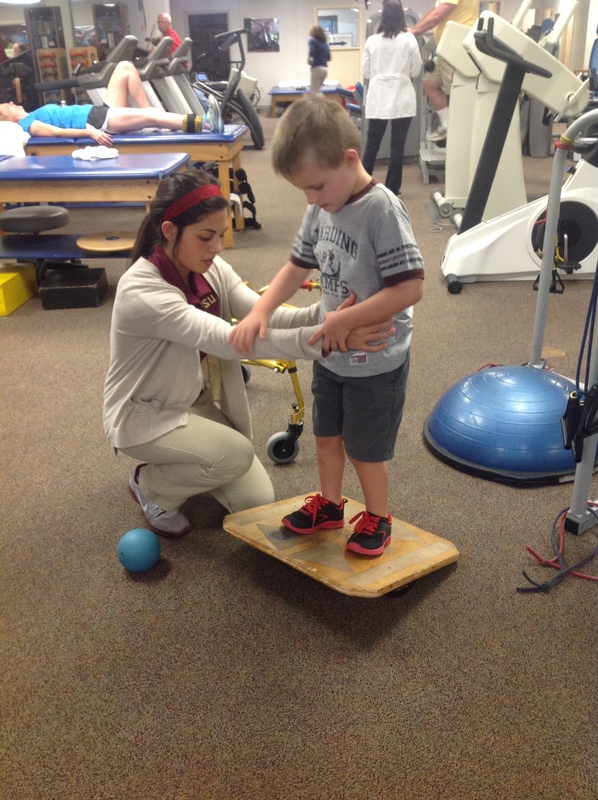 Dr. Killian wanted Cole to reach 90% in flexibility and range of motion in both his right knee and right hip. I’m not sure any of us expected him to achieve this goal so quickly. He was able to do this weeks ago, and in return, start walking without his leg immobilizer. 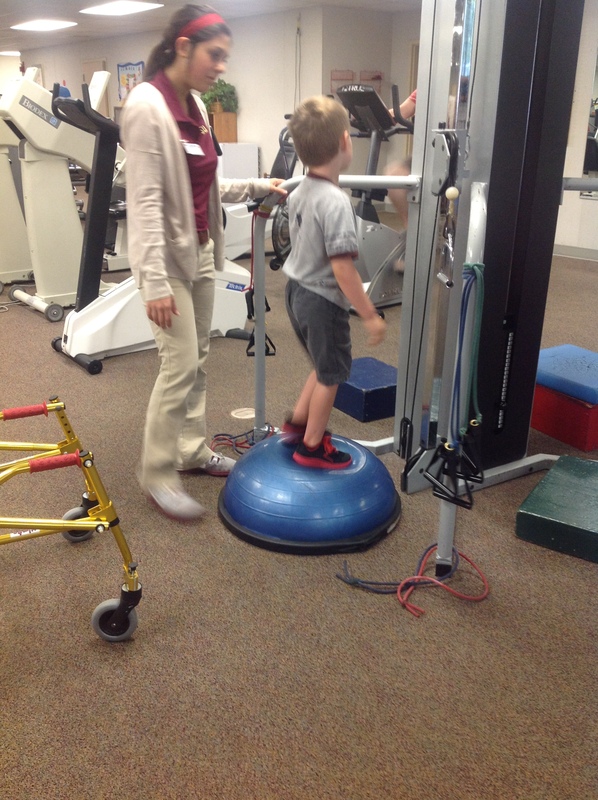 He still uses his pediatric walker to get around, but this past week at therapy, his PT suggested leaving the walker behind so he can continue to strengthen his hip and ability to walk. At therapy, Cole works on balancing exercises, some flexibility exercises, but then comes the dreaded time of getting on the table for stretching. Aside from Perthes breaking down the bone structure in his hip, it caused some of the tendons to shrink (resulting in a tenotomy during surgery) and then being in the cast for over a month did a number on his muscles. But these are still the problem areas that will continue to need work. And that is where there is pain. I watched as he winched, muscles spasmed and his face visibly showed the pain of pushing his muscles beyond their current range of flexibility. And his PT reminded him how important her stretching his muscles were despite the pain it causes him. There is a completion or maturity that would appear is only available through trials – through pain. I’d be the first to admit that I would much rather reach maturity or completion via a softer, more gentle, pain-free route… but Scripture doesn’t seem to make provisions for that route. Rather, we are reminded, “And we know that in all things God works for the good of those who love him, who have been called according to his purpose” (Romans 8:28). And the “all things” would certainly include pain in our life. So Cole will continue to face pain in the weeks, months and possibly years ahead. But just like in life, we frame out the pain with a purpose. A purpose that will God-willing ultimately bring strength and healing to his leg. And even in the physical pain that will bring gain in his story, we pray even more that He will see and experience the spiritual gain by walking this journey God has for him. A journey marked by God’s faithfulness and continued provision and healing. Thank you for continuing to pray for us and encourage us in this journey. We will return to Alabama near the end of this month for a follow-up with his doctor. Until then, we press through the pain with the hope of the gain!